Style Theory: Dungarees are slowly (slowly) becoming an acceptable garment for a 'grown up' to wear and since I have worn my black H&M non stop I thought I would dive into it a little further with blue denim dungarees..
Denim dungarees can be tricky, they are slightly harder to wear than the black tailored version as they can veer towards the Huckleberry Finn look fairly easily. 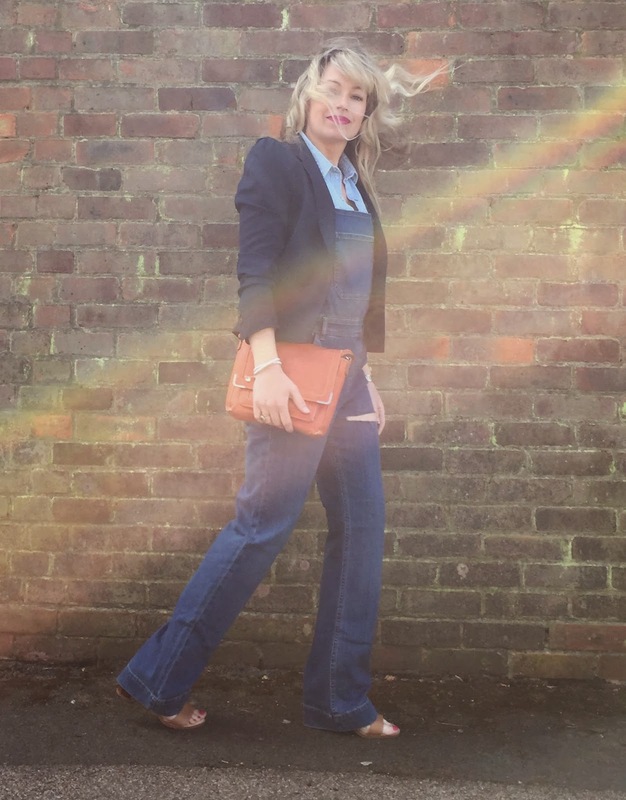 I wanted to style these Asos ones with a grown up twist to hopefully avoid the overgrown baby look, so I paired them with a denim shirt, my trusty navy Zara blazer and sandals. They are, I agree, a complete love them or hate them item, I kinda love them as they are so comfortable (I love having no waistband digging in to my stomach) and pretty versatile. They look just as good with trainers as with heels. The wide leg look ticks this season 70s trend but does need to be worn with heels so as to elongate my legs. These are from Asos and have a rather large (really bad on me) rip across the thigh. 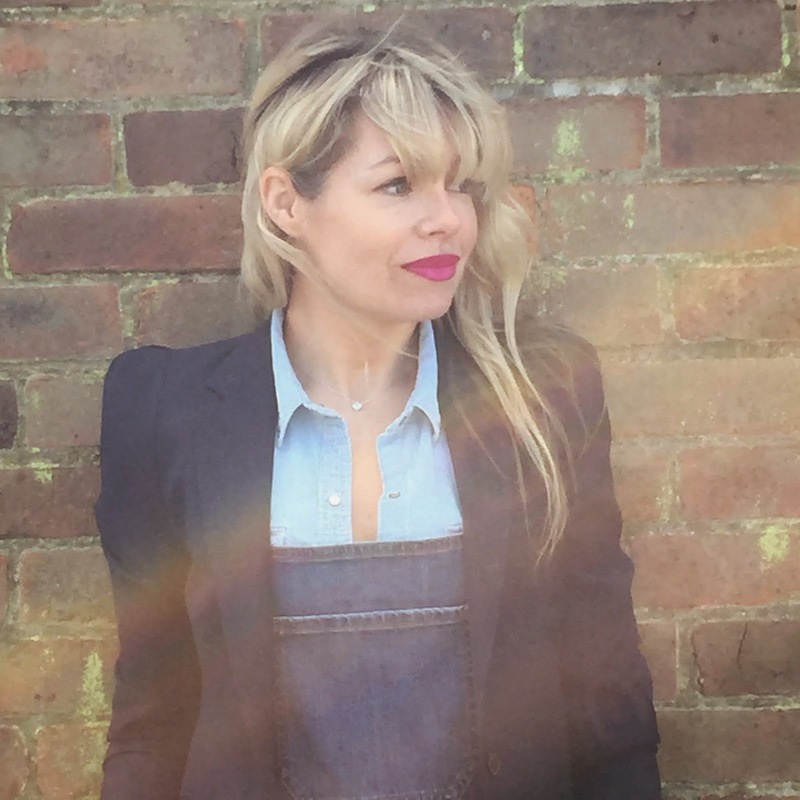 In my opinion it is completely unneccassary and will be patched up when I have a second to no.1) read SusieSoSo's guide to patching up jeans (Sue is seriously amazing at tips and tricks and finding fab high street finds) and then secondly getting my needle and thread out and do it. These are a most definitely a "flash trend', they have been bubbling around for the last few years with the trend really coming to the fore this year but I do not see it having much longevity so I would buy non-expensive and wear lots now. 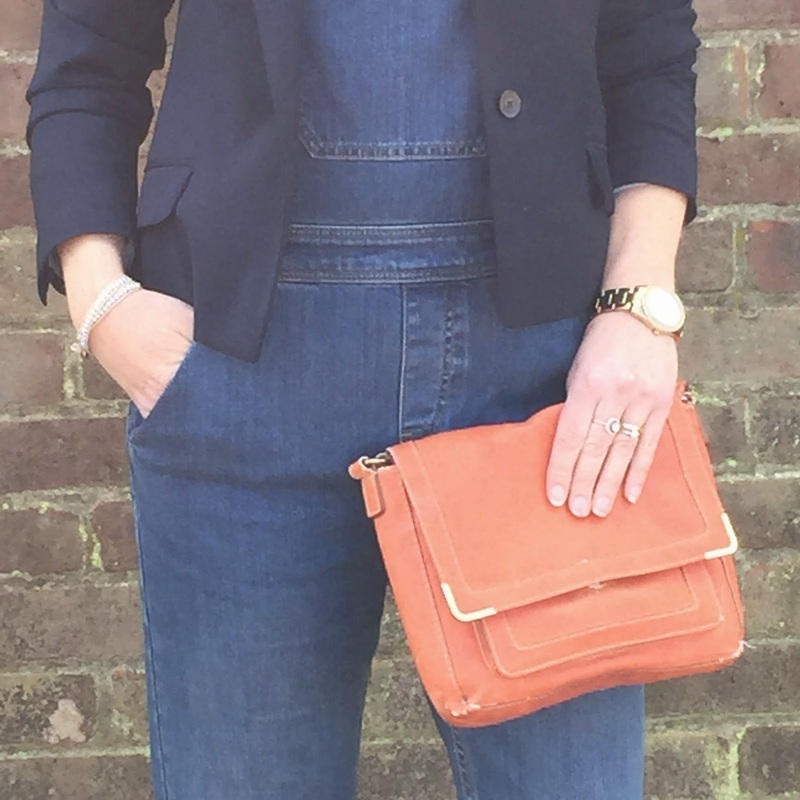 A fairly baggy slouchy dungaree, would look fab with a tailored shirt and heels. These are a really soft, comfortable, light denim with a little stretch. Perfect for summer holidays, wear with a vest top and sliders for a cool, laid back look. The description of these state that they are 'full length' but they look ankle length to me. These will be a flattering dungaree as they are a neat fit with a slim leg. 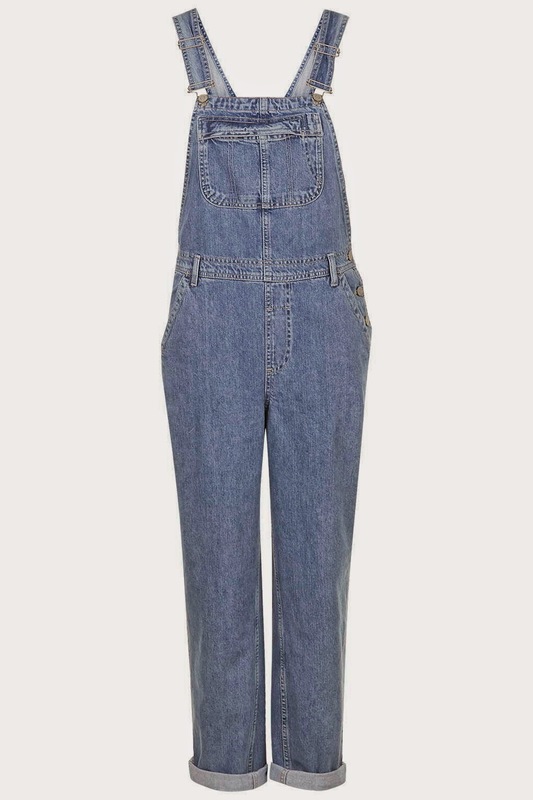 The plain styling at the front of these dungarees will flatter, as with all clothing it is a matter of trying on different styles of dungarees to see which ones are cut right for your body shape. These are my dungarees in the photos above, at 5ft2 these are the perfect length with heels for me (if a teeny bit long) They fit true to size and are super comfy, just need to patch up that rip! Are you in the love them or hate them camp? 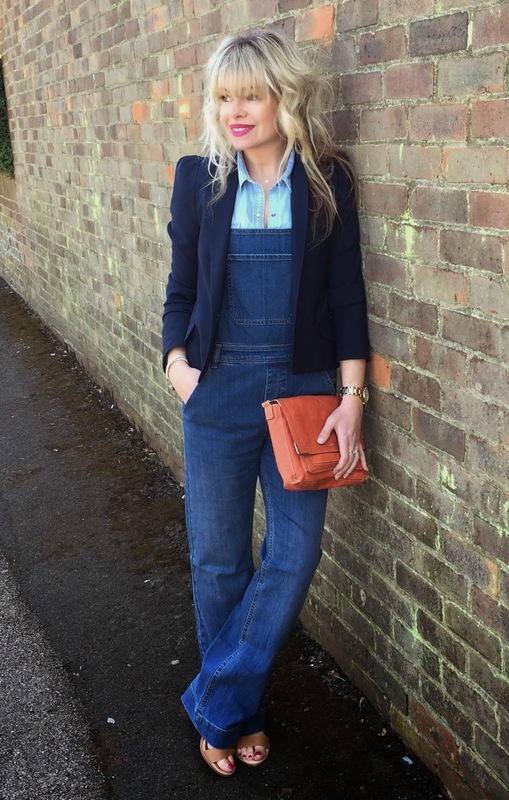 Have you divulged in the dungaree trend as yet? I must admit I have tried on so many pairs to find a pair that fit me properly, some are too long on the body, too tight, too loose on the leg so if you are wanting some try, try and try again with different styles you will find your perfect pair! I like them and have the H&M black ones as well. Tried the ecru ones but they're not as good. Those ASOS ones are nice but agree about the thigh rip. Why? You definitely pull these off - I won't be touching this trend with a barge pole though. I like your wider legged pair here, some of the dugarees I've seen online/in magazines are just awful. 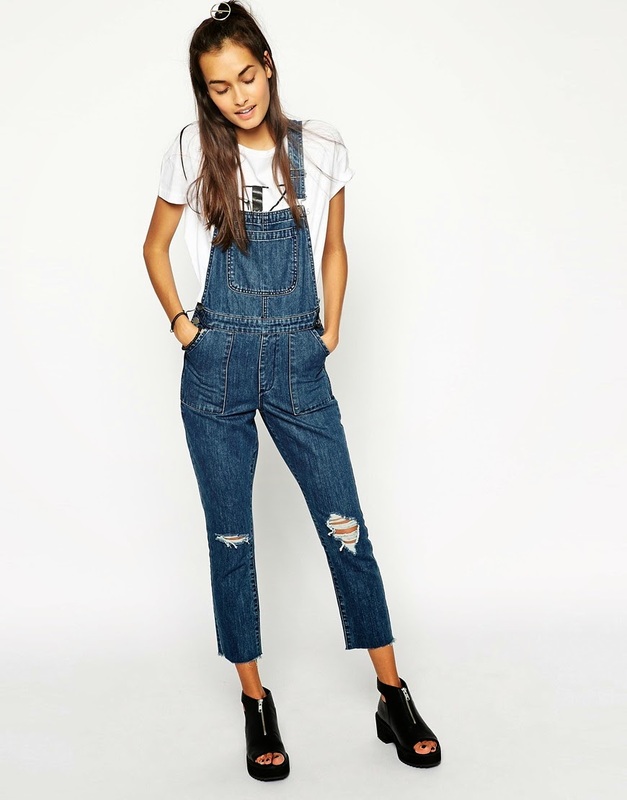 Love the flare style for dungarees, they definitely look less grown-up in kids clothes. The rip would put me off too, it doesn't look good on the model even. Sue's jean patching is great. I have just added another patch to a pair of boyfriend jeans. It's definitely love from me, but the dungarees just don't love me back! I've bought and returned numerous pairs (I only blogged one pair and after that it was just getting boring/depressing/all-round hideous!! ), but I'm just too broad in the hips to get the sizing right - if they fit my bum, they're hanging off my top half. WOW - simply stunning and totally inspired to jazz up my boring black ones!